Nearly all of the recorded shipwrecks around Graves Ledge occurred after Graves Light was completed in 1905. If Graves Light ever had any plumbing or running water, it was little more than a cold water sink and a toilet that drained into the harbor. We changed that. If many of the early postcard images of Graves Light were accurate, the steamships in the pictures would have been wrecked on the rocks. The namesake of Graves Ledge, English Rear Admiral Thomas Graves of Charlestown, Massachusetts, brought some of Boston’s earliest English settlers to the area. Rear Admiral Graves was killed fighting the Dutch in the English Channel in 1653. Graves Light was built by private contractors for the US Light House Service between 1903 and 1905. The contractors completed construction on-time and under budget, and had enough resources left to build the stone oil house. 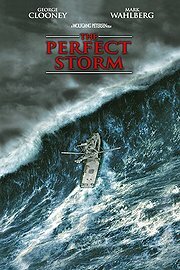 A 130-foot, heavy steel and plank catwalk between the lighthouse and oil house, anchored into the Cambridge Argillite ledge with eight-inch steel pilings, was destroyed during the “perfect storm” of 1991. Graves Light is one of only 36 “important wave-swept towers in various parts of the world,” according to the Encyclopaedia Britannica. Other “important wave-swept towers in various parts of the world” include Graves’ neighbor, Minot’s Light (pictured during blizzard of 1978); and lighthouses in California, Florida, Michigan (Lake Huron), Ireland, Great Britain, France, Germany, India (Bombay/Mumbai), Ceylon (now Sri Lanka), Singapore, and Daedalus Reef (Abu Kizan) in the Red Sea off Egypt. There is a secret cave on Graves Ledge. 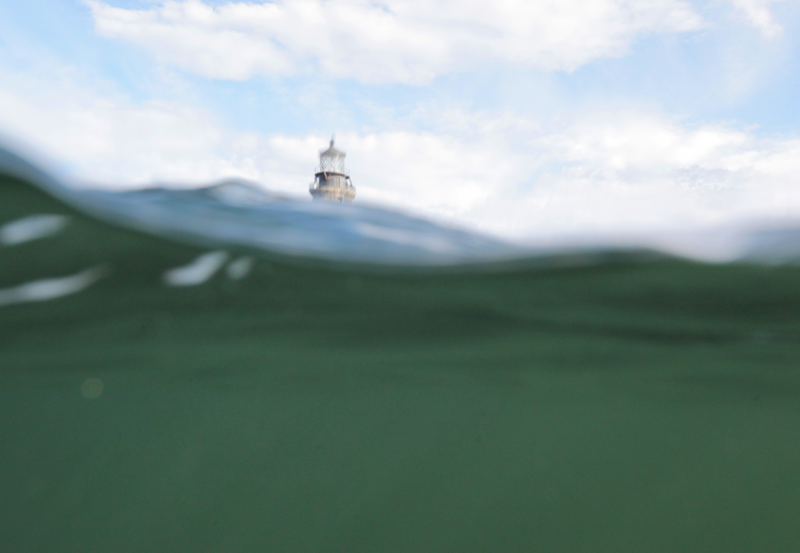 At high tide, the base of Graves Light is completely submerged under ocean water. The granite for Graves Light was quarried in Rockport, Massachusetts. 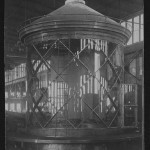 The 40,000-pound bronze watch room, lamp room, and roof were cast and forged in Milwaukee, Wisconsin (pictured in foundry). The original first order Fresnel lens, which after modification cast a 3.2 million candlepower beam, was made in France. 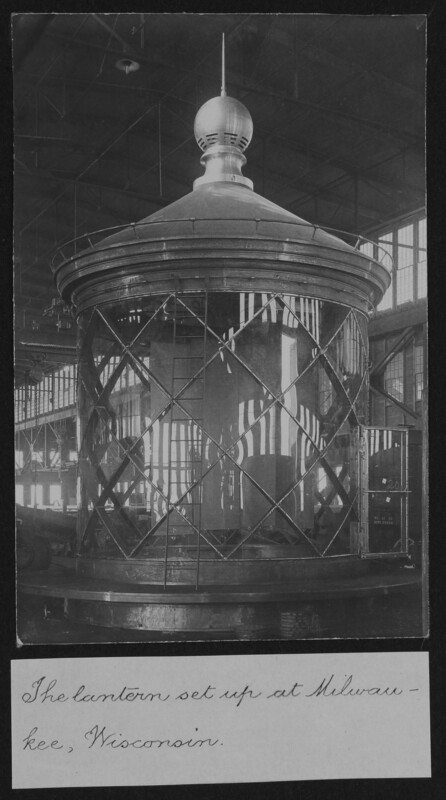 To rotate smoothly with minimal friction while remaining perfectly level, the Fresnel lens floated on a pool or “bath” of 400 pounds of mercury. The first keeper of Graves Light, Elliot C. Hadley, was from Winthrop. The US Coast Guard removed the Fresnel lens when Graves Light underwent automation in 1975, and sent it Washington DC as a centerpiece of the bicentennial exhibit. It has sat in storage ever since. 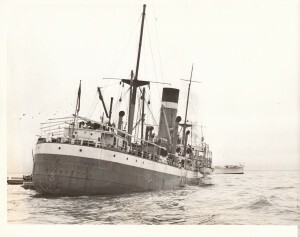 After automation, Graves was powered from shore via an underwater cable. Graves Light was converted to solar power in 2001. The present automated, solar powered Vega VRB-25 rotating beacon was made by Hydrosphere Ltd., of the UK. The current automated FA/232 fog horns were made by Automated Power, Inc., of Houston, Texas. The FA/232 fog horns crank out 122.7 decibels, while using only 12 volts DC on a 2.2 amp current. A level of 120 decibels is considered “deafening,” equivalent to sound emitted by a riveter, being in a diesel engine room, up-close to a fireworks display. A thunderclap is also 120 decibels. Fortunately, the fog horn is directional and sends most of its sound out to sea. At the same time the Graves fog signal was being automated, the British rock band The Who broke all records as the world’s loudest band, at 126 decibels. The fog horn is tripped by radio signals from a laser fog sensor three miles away at Boston Light. That same fog sensor trips the fog horn at Minot’s Ledge Light off Cohasset. 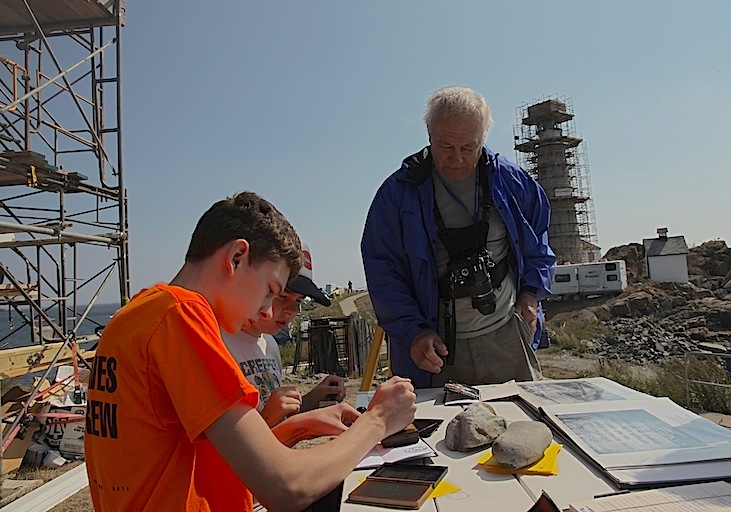 You can see 4 days of rising and falling tides, sunrises and moonrises, and restoration work in a 34-second stop action video (pictured). At night, phosphorescent (bioluminescent) microbes can make waters around Graves Light glow a deep blue. 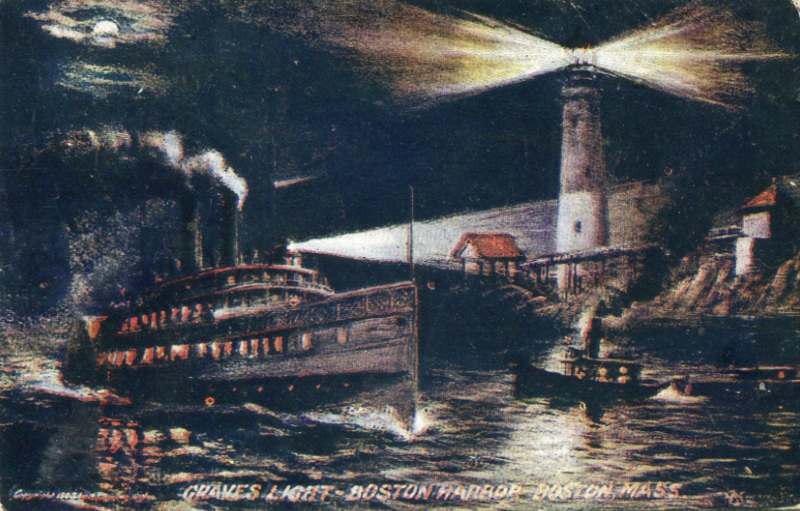 Graves Light was built by a 1902 act of the US Congress to mark entrance to Boston Harbor’s new North Channel, created to accommodate giant iron steamships. 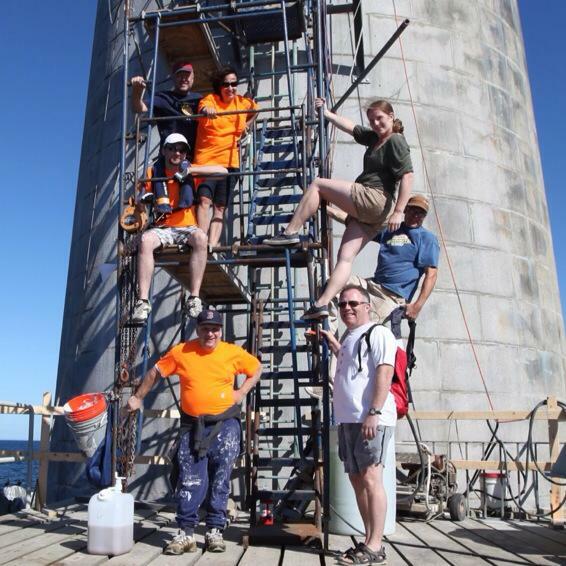 Total construction cost for Graves Light: $188,000 in 1902 dollars (about $5 million today). The first people to swim to Graves Light were four men – two from the L Street Brownies swim club – who swam 12 miles from Charlestown Bridge on August 2, 1914. 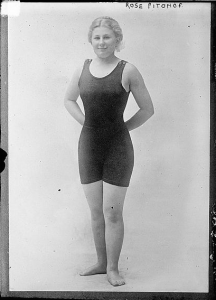 Two weeks later, the first woman swam to Graves Light: 19 year-old Rose Pitonof of Dorchester (pictured). Rose Pitonof had previously tried to swim the English Channel. She later went on to become a Vaudeville performer. During target practice in 1937, US Army artillerymen at Fort Banks in Winthrop fired shells too close for comfort to the lighthouse. The Superintendent of Lighthouses filed a written protest to the commanding officer, saying that explosive shells landed within 200 yards of Graves Light. 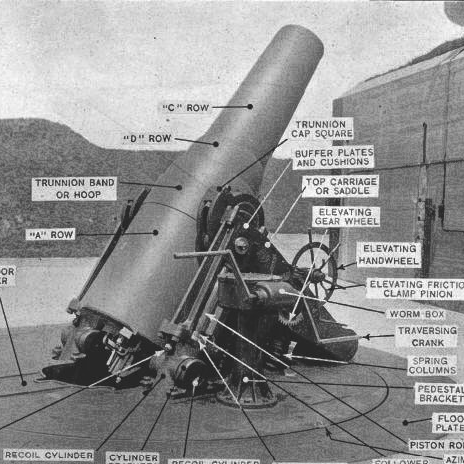 The artillery at Fort Banks at the time was a battery of huge 1890M1 mortars (pictured) that fired 12-inch-dimeter anti-ship shells as far as 9 miles out to sea. Each shell contained between 700 and 1,046 pounds of explosives. 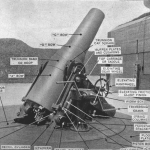 By comparison, the famous Mark-7 depth charges of World War II contained 600 pounds of TNT. While the Army seemed to indicate that the target practice 200 yards from Graves was no big deal, a modern Federal Emergency Management Agency (FEMA) chart (fig. 4.2, p. 8) shows that the concerns of the lighthouse crew were well-founded: A surface explosion of 700 to 1,000 pounds of TNT would produce severe wounds from flying glass in a building 200 yards away. The Graves Light Station is listed in the National Register of Historic Places. Graves Ledge, or “The Graves,” is part of the group of islands known as The Brewsters, the outermost islands in Boston Harbor. Some of the best striped bass fishing in the Boston Harbor area is right around Graves Ledge. The granite walls of Graves Light are 7 feet thick at the entrance level. The lighthouse is visible from a 24-nautical mile range. 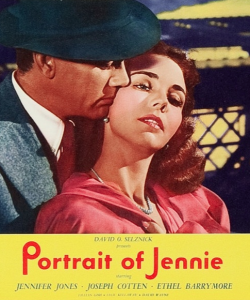 Graves Light was used as a set for the 1948 movie Portrait of Jennie, starring Jennifer Jones, Joseph Cotten and Ethel Barrymore (the great aunt of Drew Barrymore). The lighthouse in Portrait of Jennie was supposed to be on Cape Cod. A young actress playing a minor, uncredited role in Portrait of Jennie, Nancy Davis, would become first lady of the United States of America (Nancy Davis Reagan). At a height of 113 feet, Graves Light is the tallest lighthouse in Massachusetts. Like Graves Light architect Royal Luther, today’s new owners are from Malden. The most unusual shipwreck off Graves was the SS City of Salisbury, the “zoo ship” laden with exotic animals – including pythons, cobras, honey bears, and 300 monkeys – from India and Ceylon. All the people aboard and most of the animals were rescued. 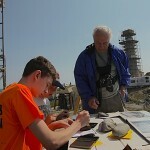 A researcher at the National Archives in Washington, DC, found and made copies of the Graves Light keepers’ logs from 1905 to 1976. 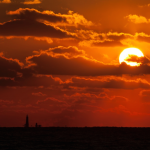 An early US Light House Service keeper at Graves Light reported in his log that he encountered two naked, sunburned men who drifted to the ledge in a canoe. He wrote that he gave them fresh clothes and they gave him false names. The Boston Globe editorial board supported Dave Waller’s purchase of Graves Light in 2013. 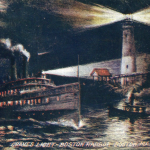 Under the federal National Historic Lighthouse Preservation Act of 2000, the proceeds from the sale of Graves Light went directly to the Coast Guard, for the purpose of restoring other lighthouses. 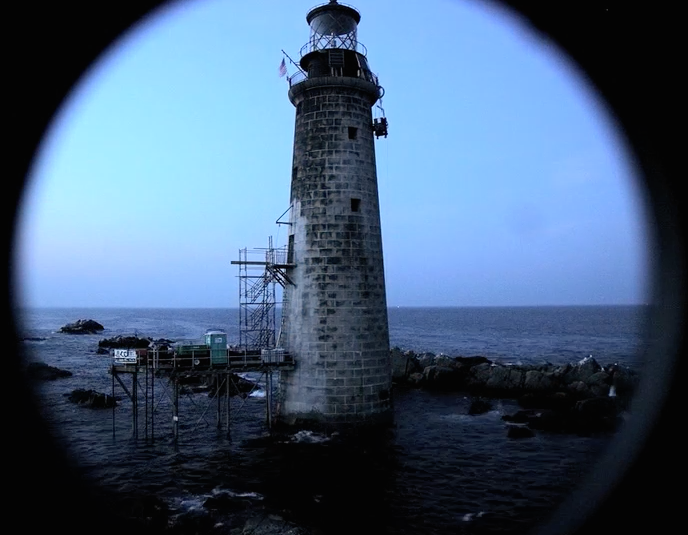 Although Graves Light is now privately owned, the Coast Guard continues to operate and maintain the beacon and fog signal as aids to navigation. We conducted several “volunteer paint parties” in the summers of 2014, 2015, 2016, and 2017 in order to protect the freshly cleaned interior from the salt air. Way to go, volunteers! While clearing Graves Ledge for restoration, we found the submerged 1905 air compressor from the original foghorn. 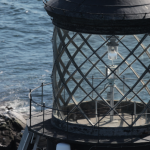 Many of the wood, brass, and glass materials used in the restoration of Graves Light are recycled from antique buildings, steamships, and other lighthouses. The old mortar between Graves Light’s granite blocks was completely removed in 2014 and replaced with fresh mortar using methods and materials approved by the National Trust for Historic Preservation. Powdered granite from the same Rockport quarry that provided the original stone blocks was used to fill and hide cracks and holes in the blocks. The nine windows in the granite tower were restored to their original appearance and function in 2014, modeled on a rotted original 1905 casement window discovered in the oil house. The reproduction casement window frames were hand-made of oak and brass by a master carpenter in Nantucket. 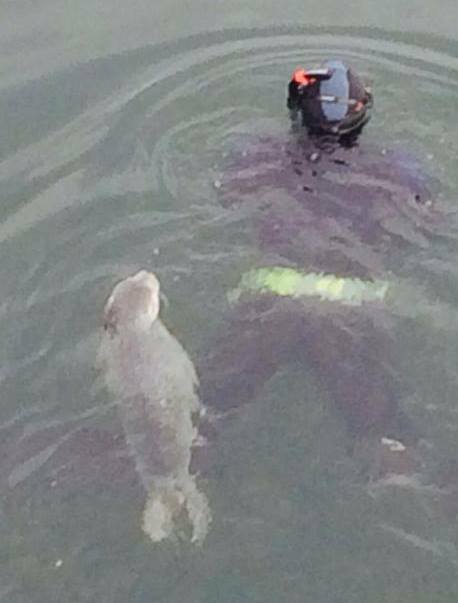 In 2014, diver Pat Breen counted 19 harbor seals and one bull grey seal living on and around Graves Ledge. 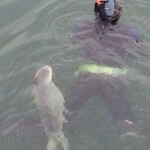 A new harbor seal pup befriended Pat during his summertime dives (see photo). 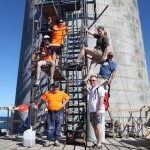 The original underwater moorings used during the construction of Graves Light from 1903-1905 were discovered in 2014 and are now used for the restoration. Graves Ledge is within the boundaries of the US National Park Service’s Boston Harbor Islands National Recreation Area. 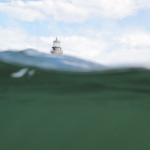 The ledge is considered one of the best dive sites in Boston Harbor. The bronze and glass skylights of the Graves Light watch room were cleaned and restored offsite and reinstalled. 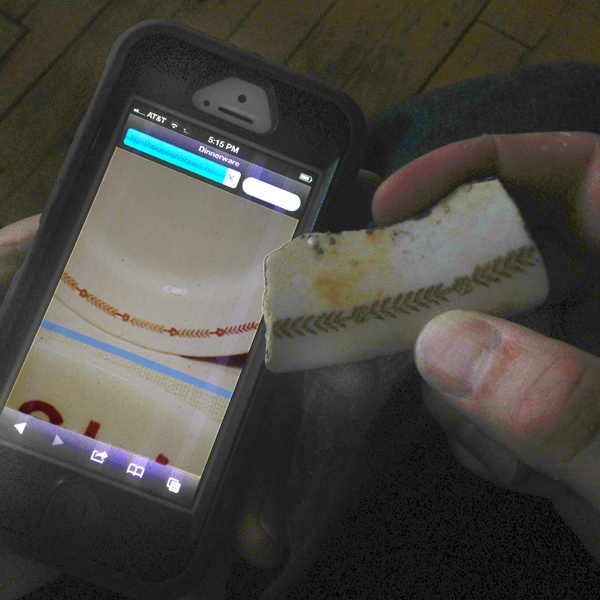 Using an original as a template, we had replacements made in Nantucket for the missing pieces. 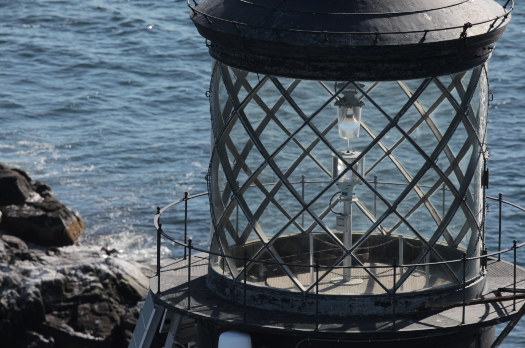 The most architecturally similar light to Graves is Ram Island Ledge Light at the entrance to Portland Harbor, Maine. Both Graves Light and the shorter Ram Island Ledge lighthouse were built at the same time (1903-05) and converted to solar at the same time (2001). Graves Light’s signal is two white flashes every 12 seconds. Its fog signal is two blasts every 20 seconds. 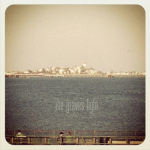 From land, the best places to view Graves Light are from Nantasket Beach in Hull, the southern shoreline of Nahant, and Shore Drive in Winthrop. We built a second story of cast marine concrete for the granite oil house, and put it in place with a heavy-lift Air Crane helicopter in 2019.